If there’s something I love more than food, it’s food history. If it’s Canadian food history, consider me sold. 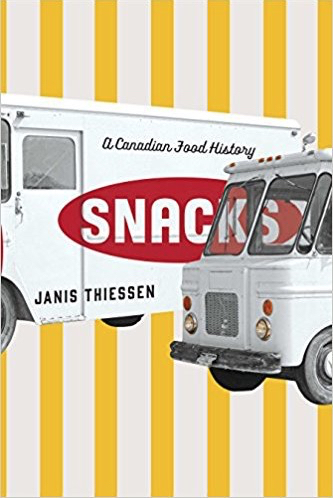 Janis Thiessen’s Snacks: A Canadian Food History hits all the right notes for me, making is an absolute must read. “Snacks” is a history of Canadian snack foods, of the independent producers and workers who make them, and of the consumers who can’t put them down. Janis Thiessen profiles several iconic Canadian snack food companies, including Old Dutch Potato Chips, Hawkins Cheezies, and chocolate maker Ganong. These companies have developed in distinctive ways, reflecting the unique stories of their founders and their intense connection to specific locations. These stories of salty or sweet confections also reveal a history that is at odds with popular notions of “junk food.” Through extensive oral history and archival research, Thiessen uncovers the roots of our deep loyalties to different snack foods, what it means to be an independent snack food producer, and the often-quirky ways snacks have been created and marketed. Clearly written, extensively illustrated, and lavish with detail about some of Canadians’ favorite snacks, this is a lively and entertaining look at food and labour history. So, who would have thought that a must read book would be published by a university? Not me. I gladly left my textbooks behind many, many years ago and have not looked back. It’s not that I don’t still read to learn. It’s just that text books tend to be written with about as much enthusiasm as one would find in the dentist’s waiting room. The first bit of Snacks did seem to be teetering dangerously toward textbook sawdust. But, you do have to remember that it is the culmination of a lot of research and the methodology is helpful to reference. If you really don’t care, feel free to skip over the introduction. The stories pick up quite quickly after that. Behind the scenes interviews with all kinds of different stakeholders – line workers, executives, union representatives, customers – all of them add something unique to the narrative behind our favourite foods. What I found perhaps most interesting is the counter-intuitive assertion that snacks are not inherently bad for you. A quick historical trip seems to show that increasing our caloric intake coincided with the Industrial Revolution, when time became worth a lot more money, and people needed to eat and get back to work quickly. Thiessen pokes considerable holes in writings of Michael Pollan and Jamie Oliver. The slow food and artisan maker movements are held up to a critical light, exposing the considerable flaws in the logic they present. Most refreshingly, Thiessen shines a light on the vague and ill-informed elitist position each holds. 22 Responses to "Snacks: A Canadian Food History Book Review & Giveaway"
potato chips come to mind first! Samosas are my all time favourite snack. Oh man...how can I pick one favourite snack food?! Hmmm....I'm going to have to go with popcorn. I'm a massive snacker, so it's really hard to pick just one, but if I HAD to choose, then I guess potato chips - I have a hard time turning them down! My favorite would be chips and dip! Chips, chips and more chips. Dangerous to have them in the house! I am a big fan of chips! I think my all time favourite would have to be ketchup chips! My all time favourite snack food is salted and buttered popcorn. Potato chips is my all time favourite snack food. I'm a fan of candy, seeds & nuts! Plain salted potato chips has always been my favourite snack food. Chocolate if I'm in the mood for something sweet, or potato chips if I'm in the mood for salty, or cheese & crackers if I'm looking for a snack to ward off hunger to my next meal.